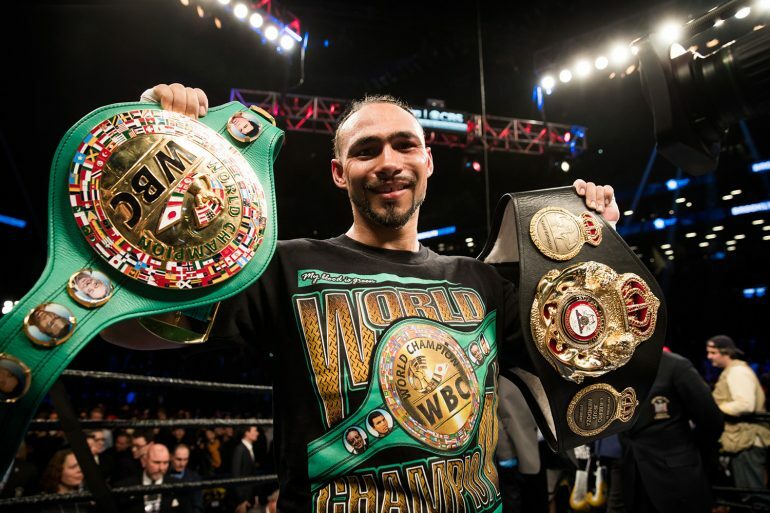 It’s not easy to define Keith Thurman. Yes, he’s a fighter. Yes, the WBA/WBC welterweight titlist is among the world’s best 147-pounders. Yes, Thurman is an iconoclast when it comes to boxing. The 28-year-old from Clearwater, Florida, kind of marches to his own beat. On April 19, Thurman (28-0, 22 knockouts) underwent surgery to remove painful calcium deposits and bone spurs from his right elbow. Originally, he thought he would return to the ring by later this year. Now a more realistic timetable has emerged. Thurman will probably have his first fight in close to a year next February or March, he announced to the gathered press at the 154-pound tripleheader at Barclays Center, in Brooklyn, New York, last Saturday night. Thurman has only fought twice in as many years. It was first appearance Thurman made in front of the boxing media in general, since his unification victory over Danny Garcia on March 4, at Barclays. “I was happy that I got to fight Danny so early because I feel the welterweight division is a dangerous division with Danny Garcia,” Thurman said. “The injury was brand-new and I never felt pain like that through any of my boxing matches or any other of my training camps. 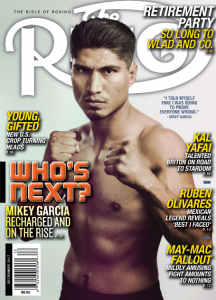 I did start to feel it in my training camp for Danny Garcia. I got an MRI and the results showed I had loose bodies floating around in the joint region, which was hindering my elbow from locking out. “I was fighting inflammation, mild pain in the elbow and I was icing it. I stopped sparring a little shortly into that camp and just waited it out. The doctor said I was OK for the fight. I used the right elbow the night of the fight. I got married and came back. I’m back here in New York and I feel good. I think I’ll need four-to-six weeks of rehab and I feel better than I ever did. The elbow really is progressing. Thurman stressed that the surgery had to be done. He also feels he could have put on a much better performance against Garcia, if he were fully healthy. However Thurman did admit, privately, he fought Garcia at great risk. “That could have been the last performance of my career,” Thurman said. “That’s how bad my elbow was. When you look at the bigger picture (now), you realize that everything is OK. This is what I have to do. There have been times when I’ve been here in Nepal, during this vacation, and I (tell myself) I had such a great camp for (Garcia), with the conditioning and everything that I was doing. “I enjoyed being in the gym and, afterward, I could have been right back in the gym, if possible. I know I have a career in the sport that I love. This is the art that I chose to be in, as a child. That makes me happy. I stay positive and stay happy to live the life of Keith ‘One Time’ Thurman. My bigger picture is that I’m the undefeated, unified welterweight champion of the world. Nobody else gets to say that. While his professional career was on hiatus, Thurman married Priyana Thapa on June 30. Thurman met the 24-year-old Nepalese woman last year in Roppongi, Japan, a few months after his successful June 2016 title defense against Shawn Porter. “I wanted to see Tokyo and, everywhere I go, I see and meet boxing people and it’s a beautiful thing to meet people that admire what you do,” Thurman said. “I went to a small club lounge and Priyana worked behind the bar. It happened to be my first night in Tokyo. It was a Sunday night and my buddy and I got real familiar with that bar. She didn’t know who I was. “I wasn’t looking for love or anything and she happened. I asked her out and that date happened to be one of the best days of my life. People search real hard to find someone like her. I got out of my comfort zone and found my love. She’s made this (injury) go away. I didn’t let her know who I was because boxing is just a job, something that I do. Boxing provides the chance to get away. It’s enabled me to see the world – and now it’s led to me to meeting the love of my life.